This story was originally published in Hebrew on Newsgeek.co.il. At the end of each year, Israel’s Shenkar College organizes an exhibition showcasing the final projects of that year’s graduates from the different departments of the college. Newsgeek makes a habit of attending these events, and every year we choose the most interesting technology related projects, where the students have displayed an innovative design or breakthrough. 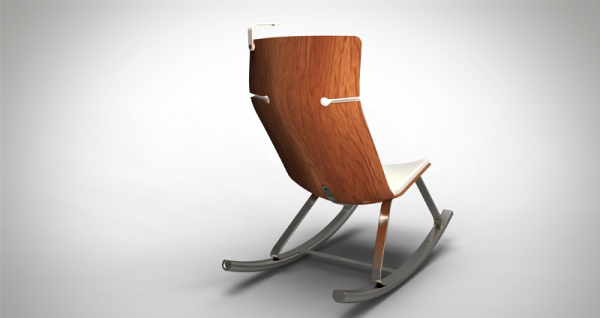 Take for example the Ortarky Chair, a stylish rocking chair that generates electricity as you use it. Like many other countries around the world, extreme weather can create a shortage of energy, and in the past few years the Israeli summer has challenged the Israeli national electric company’s ability to keep up with demand. Just a few years ago, talk about a day when the amount of electricity produced would not meet the demands was considered theoretical, but this summer we have already faced selective power outages on extremely hot days. As the summer heats up, fear of more outages increases, as they become more common. This situation emphasizes Israel’s dependency on electricity, through all the technology we use on a day-to-day basis. In fact, most of the tech and gadgets we use require frequent charging. What will we do when the day will come, where we have to ration our electricity? This dilemma is not unique to Israel, and in fact, there are some European countries where extreme weather conditions have created extended power outages during the last few European winters. As our use of technology increases, so does our dependency on it. In fact, if you want to get an idea of how dependent we are on technology, ask yourself when was the last time you rode on some form of public transportation and didn’t use a gadget, cellphone or any type of technology? Since we want all our gadgets to be fully juiced when we are on the go, at work, and usually also at home, the demand for energy is driving the electricity prices sky-high. At some point, energy might become too expensive for consumers, and rationing might be called for. As the cost of manufacturing electricity in a power plant keeps rising, sometimes it’s best to look for local solutions to these such problems. Igor Gitelstain, a recent graduate of Shenkar College, decided to devote his graduating project to the design and development of an idea with a long-term appeal, one that will still be relevant in 2020. “In choosing this topic, I’ve tried to avoid looking for a sophisticated solution for a non-important problem. That is why I chose to focus on energy. Like many others, I believe that the world will change in the near future. Energy will become a precious commodity, much more than fresh water, fuel and clean breathable air. The economic and environmental price of burning fuels to generate electricity, and our dependency on our energy suppliers proved to be a substantial challenge”. “I’ve been intrigued by the need to cut away from the energy and corporate restraints , and so I set out to search for an object I can redesign, which will include a simple mechanism to produce green energy for personal use”. “According to my vision, many products will include a function of returning the energy that was invested in their creation, beyond their conventional and aesthetic uses. The energy that the chair produces will join other renewable electricity generators within the household, such as solar panels and wind turbines. All the generated energy will be stored in a local household battery. Other examples might include doors that generate electricity or swings for children. The idea is that the consumers can provide for their own energy needs. “In designing the chair, I tried to make its special function less obvious. In my view, we have passed the stage where a green design needs to be reflected in a specific green design language and therefore must be colored in green. That is why the mechanism is hidden, and the whole design tries to steer away from a look of a gadget. If the chair gets produced on an industrial scale, I’d like people to buy it not only because of the electricity, but because of its looks. The chair is made out of laminated wood, soft coverings and metal”. “The technological solution I’ve derived from looking into various projects for producing electricity, and the solution chosen was a linear generator. 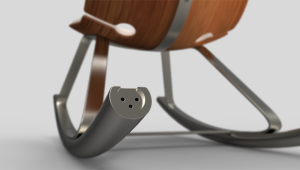 That way, in my project, there is a powerful magnet stowed away inside the rockers. The magnet slides back and forth in a tunnel lined up with copper coil, and generates a current. The energy can then be routed to the main household battery, or plugged into any gadget”. Tutoring this project was designer Pini Leibovich.